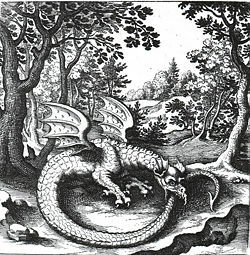 Engraving of Ouroboros (a dragon swallowing its own tail) by Lucas Jennis, in alchemical tract titled De Lapide Philisophico. This article focuses on European dragons. The dragon is a mythical creature typically depicted as a large and powerful serpent or other reptile with magical or spiritual qualities. Although dragons (or dragon-like creatures) occur commonly in legends around the world, different cultures have perceived them differently. Chinese dragons, and Eastern dragons generally, are usually seen as benevolent and spiritual, representative of primal forces of nature and the universe, and great sources of wisdom. 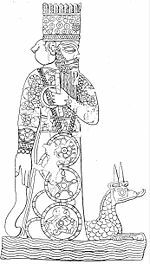 In contrast, European dragons, as well as some cultures of Asia Minor such as the ancient Persian Empire, were more often than not malevolent, associated with evil supernatural forces and the natural enemy of humanity. The most notable exception is the Ouroborus, or the dragon encircling and eating its own tail. When shaped like this the dragon becomes a symbol of eternity, natural cycles, and completion. Dragons are commonly said to possess some form of magic or other supernormal powers, the most famous being the ability to breathe fire from their mouths. Over the years dragons have become the most famous and recognizable of all mythical creatures, used repeatedly in fantasy, fairy tales, video-games, film, and role-playing games of pop culture fame. While still seen as powerful and often dangerous to humankind, the latter part of the twentieth century saw a change in attitude, with the good qualities of dragons becoming more prominent. No longer must all dragons be defeated by the hero or saint, some are ready to share their wisdom with human beings and act as companions, friends, and even guardians of children—roles that parallel those of the angels. The word "dragon" has etymological roots as far back as ancient Greek, in the verb meaning "to see strong." There were several similar words in contemporary languages of the time that described some form of clear sight, but at some point, the Greek verb was fused with the word for serpent, drakon (δράκον). From there it worked its way to the Latin language, where it was called Draconis, meaning "snake" or "serpent." 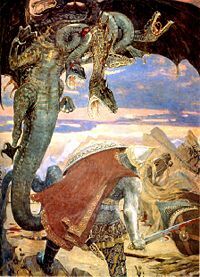 In the English language, the Latin word was split into several different words, all similar: Dragon became the official name for the large, mythical creatures, while variations on the root, such as "draconian," "draconic," and "draconical" all came to be adjectives describing something old, rigid, out of touch with the world, or even evil. Dragons generally fit into two categories in European lore: The first has large wings that enable the creature to fly, and it breathes fire from its mouth. The other corresponds more to the image of a giant snake, with no wings but a long, cylindrical body that enables it to slither on the ground. Both of these types are commonly portrayed as reptilian, hatching from eggs, with scaly bodies, and occasionally large eyes. Modern depictions of dragons are very large in size, but some early European depictions of dragons were only the size of bears, or, in some cases, even smaller, around the size of a butterfly. Some dragons were personified to the point that they could speak and felt emotions, while others were merely feral beasts. Scholars have attempted to uncover the true source of dragon legends since reports of the ancient creatures themselves have been made public. While it is most probable that dragons in the form popular today never did exist, there is evidence to suggest that perhaps the belief in dragons was based on something real. Some have looked to dinosaurs as the answer. It is known that ancient cultures, such as the Greeks and Chinese found fossil remains of large creatures they could not easily identify. Such fossils have been held responsible for the creation of other mythical creatures, so it is possible that the belief in dragons could have been fostered in the remains of real animals. Some take this hypothesis a step further and suggest that dragons are actually a distant memory of real dinosaurs passed down through the generations of humanity. This belief explains why dragons appear in nearly every culture, as well as why the dragon is more closely recognizable as a dinosaur than any other animal. However, such theories disregard the accepted timeline of the Earth's history, with human beings and dinosaurs separated by sixty-five million years, and therefore are disregarded by mainstream scholars. It is more likely that a lack of understanding of nature, certain fossils, a stronger connection with the supernatural, and even perhaps a widespread fear of snakes and reptiles all helped form the idea of the dragon. Some of the earliest references to dragons in the west come from Greece. Herodotus, often called the "father of history," visited Judea c.450 B.C.E. and wrote that he heard of dragons, described as small, flying reptile-like creatures. He also wrote that he observed the bones of a large, dragon creature. The idea of dragons was not unique to Herodotus in Greek mythology. There are many snake or dragon legends, usually in which a serpent or dragon guards some treasure. The first Pelasgian kings of Athens were said to be half human, half snake. Cadmus slew the water-dragon guardian of the Castalian Spring, and on the instructions of Athena, he sowed the dragon's teeth in the ground, from which there sprang a race of fierce armed men, called Spartes ("sown"), who assisted him to build the citadel of Thebes, becoming the founders of the noblest families of that city. The dragon Ladon guarded the Golden Apples of the Sun of the Hesperides. Another serpentine dragon guarded the Golden Fleece, protecting it from theft by Jason and the Argonauts. Similarly, Pythia and Python, a pair of serpents, guarded the temple of Gaia and the Oracular priestess, before the Delphic Oracle was seized by Apollo and the two serpents were draped around his winged caduceus, which he then gave to Hermes. These stories are not the first to mention dragon-like creatures, but perhaps mark the time in which dragons become popular in Western beliefs, since European culture was so heavily influenced by ancient Greece. In medieval symbolism, dragons were often symbolic of apostasy and treachery, but also of anger and envy, and eventually symbolized great calamity. Several heads were symbolic of decadence and oppression, and also of heresy. They also served as symbols for independence, leadership, and strength. Many dragons also represent wisdom; slaying a dragon not only gave access to its treasure hoard, but meant the hero had bested the most cunning of all creatures. 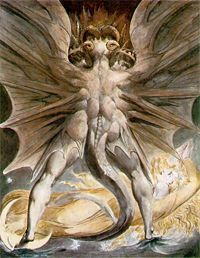 Joseph Campbell in the The Power of Myth viewed the dragon as a symbol of divinity or transcendence, because it represents the unity of Heaven and Earth by combining the serpent form (earthbound) with the bat/bird form (airborne). While there are many similarities between dragons throughout Europe, there were many distinctions from culture to culture. The following are some examples of variations on the dragon. Dragons of Slavic mythology, known as zmeys (Russian), smok (Belarussian), zmiy (Ukrainian), are generally seen as protectors of crops and fertility. They tend to be three headed, conglomerates of snakes, humans, and birds, they are never bound to one form and often shape shift. They are however, often portrayed as male, and seen as sexually aggressive, often mating with humans. They are associated with fire and water, as both are crucial for human survival. Occasionally, a similar creature is seen as an evil, four-legged beast with few, if any, redeeming qualities. They are intelligent, but not very highly so; they often place tribute on villages or small towns, demanding maidens for food, or gold. Their number of heads ranges from one to seven or sometimes even more, with three- and seven-headed dragons being most common. The heads also regrow if cut off, unless the neck is "treated" with fire (similar to the hydra in Greek mythology). Dragon blood is so poisonous that the earth itself will refuse to absorb it. The most famous Polish dragon is the Wawel Dragon or smok wawelski. It supposedly terrorized ancient Kraków and lived in caves on the Vistula river bank below the Wawel castle. According to lore based on the Book of Daniel, it was killed by a boy who offered it a sheepskin filled with sulfur and tar. After devouring it, the dragon became so thirsty that it finally exploded after drinking too much water. A metal sculpture of the Wawel Dragon is a well-known tourist sight in Kraków. It is very stylized but, to the amusement of children, noisily breathes fire every few minutes. Other dragon-like creatures in Polish folklore include the basilisk, living in cellars of Warsaw, and the Snake King from folk legends. However, the Slavic dragon is not always harmful to man. The best example of this is the Slovenian dragon of Ljubljana, who benevolently protects the city of Ljubljana and is pictured in the city's coat of arms. Having slain Fafner, Siegfried tastes his blood and comes to understand the speech of birds. In Germanic and Norse traditions, dragons were often depicted as a "Lindworm," a variation on the serpentine creatures known as the wyvern. They usually appeared as monstrous serpents, sometimes with wings and legs, but more often as gigantic snake-like creatures than traditional dragons. The lindworms were seen as evil, a bad omen, and were often blamed for preying on cattle and other livestock. They were particularly greedy creatures, guarding hordes of treasure and most often living in underground caves. Often in Germanic and Norse stories lindworms are actually people whose own greed have led to their transformation into a creature that resembles their sins, the legends of Jormugand, who ate so much he grew to be proportional to the length of the Earth, and Fafnir, the human who killed his own father to inherit his wealth and became a dragon to protect his treasure, being the most famous. Dragons have long been present in British lore. More often than not dragons were similar to the wyverns of central Europe, however there were also large, flying dragons that breathed fire. The most famous dragon in England is perhaps the one slain by the country's patron Saint George. Today, there are two distinct dragons in the British Isles. 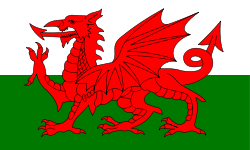 The White dragon, which symbolizes England, and the Red dragon that appears on the Welsh flag, known as (Y Ddraig Goch). An ancient story in Britain tells of a white dragon and a red dragon fighting to the death, with the red dragon being the resounding victor. The red dragon is linked with the Britons who are today represented by the Welsh and it is believed that the white dragon refers to the Saxons - now the English - who invaded southern Britain in the fifth and sixth centuries. Some have speculated that it originates from Arthurian Legend where Merlin had a vision of the red dragon (representing Vortigern) and the white dragon (representing the invading Saxons) in battle. That particular legend also features in the Mabinogion in the story of Llud and Llevelys. Dragons are not very common in Basque legend, however due to such writers as Chao and Juan Delmas' interest in the creatures, the Herensuge, meaning the "third" or "last serpent," has been preserved for today's readers. An evil spirit that took the shape of a serpent, the herensuge would terrorize local towns, killing livestock, and misleading people. The best known legend has St. Michael descending from Heaven to kill it but only once God accepted to accompany him in person. 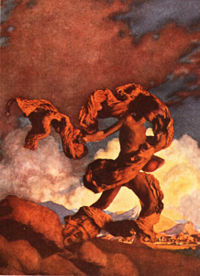 Sugaar, the Basque male god, whose name can be read as "male serpent," is often associated with the serpent or dragon, but able to take other forms as well. The legend of Saint George and the dragon is well known in Italy. But other saints are depicted fighting a dragon. For instance, the first bishop of the city of Forlì, named Saint Mercurialis, was said to have killed a dragon and saved Forlì. Likewise, the first patron saint of Venice, Saint Theodore of Tyro, was a dragon-slayer, and a statue representing his slaying of the dragon still tops one of the two columns in St. Mark's square. In the Bible, there are no direct references to dragons, but there are some creatures that seem to fit the description. In the Book of Job Chapter 41, the sea monster Leviathan has some resemblance to a dragon. Most prominent, though, is Revelation 12:3, where an enormous red beast with seven heads is described, whose tail sweeps one third of the stars from heaven down to earth. In most translations, the word "dragon" is used to describe the beast, since in the original Greek the word used is drakon (δράκον). The Medieval Church's interpretation of the Devil being associated with the serpent who tempted Adam and Eve gave a snake-like dragon connotations of evil. The demonic opponents of God, Christ, or good Christians have commonly been portrayed as reptilian or chimeric. The dragon, because it horded gold and treasure, and lived underground in lore, thus also became a symbol of sin, particularly how greed could consume a person to the point of becoming dragon-like. Around the same time, in Catholic literature and iconography, some saints were depicted in the act of killing a dragon. This became a prevalent scene, not just for saints but for Christian knights, who must kill or destroy sin, vanquishing evil, in order to save the righteous. Dragons have been portrayed in numerous works of literature. 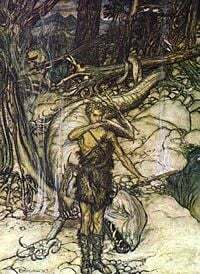 From the classics, some of the most famous examples include the Old English epic Beowulf, which ends with the hero battling a dragon; and Edmund Spenser's The Faerie Queen, where dragon creatures appear regularly. 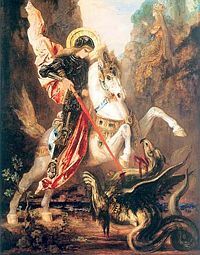 The story of Saint George slaying the dragon was incorporated into fairy tales at some point, a princess being held captive by a dragon becoming an almost clichéd theme. Most of these representations of dragons were negative—more often they were a supernatural element for a hero to overcome in order to achieve his goals. Some later fantasy writers, such as J.R.R. Tolken kept this view of dragons with his character Smaug, a greedy dragon who is brought down by his own pride in The Hobbit. However, in the twentieth century, some fantasy writers started to shift away from this view. Several writers, such as Anne McCaffrey, started to explore a kinship between humans and dragons, somewhat resembling that between horses and humans (although the dragons were generally more intelligent and could often talk). Additionally, some Christian authors have said that dragons were good, before they fell from grace, as humans did from the Garden of Eden after Adam and Eve committed the Original Sin. Also contributing to the good dragon argument in Christianity is the fact that, if they did exist, they were created by God as were all creatures. An example of this type of thinking is seen in Dragons In Our Midst, a Christian book series by author Bryan Davis. Also helping to change how dragons are viewed were movies such as Dragonheart (1996), that, although also given a medieval context, generally depicted dragons as good beings who in fact often saved the lives of humans. Dragons have also been portrayed as friends of children, as in the song and poem Puff the Magic Dragon. Thus, dragons are no longer automatically viewed as manifestations of evil, beasts that must be defeated by heroes in order to fulfill their mission, but can be seen in a vast range of roles, from companions and friends of humans, to keepers of knowledge and power. The dragon and dragon-like creatures are depicted fairly often in heraldry throughout Europe, but most notably in Great Britain and Germany. Wyverns, dragons with two back legs and two frontal wings, are the most common, depicting strength and protection, but may also symbolize vengeance. The typical dragon, with wings and four legs, is the second most popular symbol, representing wealth and power. In Britain, these types of images were made famous by King Arthur's father Uther Pendragon who had a dragon on his crest, and also by the story of Saint George and the dragon. It can be noted that even though images of dragons in heraldry could be positive, this did not change the overall negative attitude towards the dragon in Europe. ↑ Michon Scott, "Herodotus" (2005). Retrieved April 14, 2007. ↑ Buber's Basque Page, "Basque Mythology:Herensuge" (2005). Retrieved April 15, 2007. ↑ Kylie McCormick, "Dragons in Heraldry" (2004). Retrieved April 15, 2007. Manning-Sanders, Ruth. A Book of Dragons. This page was last modified on 11 October 2017, at 19:44.